One couldn't find nicer and more convivial hosts than Viv & Susan Stephens, pioneers of bamboo shoot farming on the Atherton Tablelands who opened up their property to the public yesterday under the banner of the excellent Australian Open Garden scheme. Asper Park is little gem of an acreage just outside of Atherton on the Ravenshoe road which the Stephens have converted from bare farming land to an oasis of European style gardens with an adjoining bamboo grove. 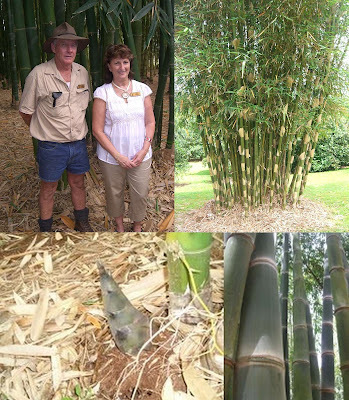 The farm is named for the variety of Indonesian Bamboo the Stephens are growing for it's shoots, Dendrocalamus Asper, a large clumping variety that grows to 30m tall. A group of about 20 visitors from all sorts of backgrounds, farmers, retirees and urban types with dreams of farmlets, turned up at 9:30am on an overcast and humid Sunday morning for a 2 hour tour of the property and learnt just about everything there is to know about cultivating and harvesting bamboo shoots. The Stephens are passionate about bamboo and were unstintingly generous in sharing their extensive knowledge and experience of bamboo farming since 2000 when they first planted their bamboo culms. Not only is the bamboo grove an incoming producing farm, it is incredibly peaceful with a stillness and serenity that feels other worldly, it would be a wonderful place for contemplation and meditation. Viv & Susan's gamble to grow a food crop that is barely known in Australia has been spectacularly successful with all of their bamboo shoots pre-sold to mostly Asian restaurants in Sydney. Viv explained the myriad other uses for bamboo which have not taken off in Australia; pulping of bamboo cane for fibre which can be used for flooring, fabric and paper, activated charcoal products - bamboo produces very high quality carbon and the obvious other bamboo appications fencing, screening and furniture making. Amazingly enough this is only scratching the surface as the uses for bamboo in Asia are even more surprising; bamboo is trained and grown into specific shapes to make musical instruments, such as saxophones and horns, as well as the better known flutes. MB saw for sale in China bamboo sleeping mats which were made of very small bamboo "tiles" woven together. Didn't look very comfortable but millions of Chinese can't be wrong! MDR has been looking for some bamboo poles for some time to build a fence and Viv was kind enough to offer him some bamboo poles when the next thinning is done in about a month's time. MDR & MB did also get to taste fresh bamboo shoot, and some of Susan's pickled bamboo shoot, which is very popular with corned beef at Olivera's deli in Innisfail. The fresh shoot was very refreshing and juicy with a slight nutty flavour, would be absolutely delicious in a stir-fry dish. Alas the shoots are only just coming into season, perhaps later in the month MB can get her hands on some fresh shoots to experiment with at home.